In this VetGirl V-Blog, we demonstrate the use of Bleed-X in a dermal mass removal. BTW, this dog was a bit dysphoric under opioid and benzodiazepine, so please excuse the noise… he was riding the analgesic wave! For those of you guys who haven't heard of Bleed-X before, it's worth checking out - worked well in this case! Below, some FAQs from Bleed-X. How does Bleed-X Vet work? The active ingredient in Bleed-X Vet Hemostatic Powder is the patented Microporous Polysaccharide Hemospheres (MPH) technology which is derived from potato starch. The MPH beads act as a molecular sieve to rapidly dehydrate blood and concentrate clotting proteins, red blood cells, and platelets to promote almost instantaneous gel formation which accelerates the natural clotting cascade. The MPH beads are combined with Oxidized Cellulose (OC) micro-fibers (derived from cotton fibers) which together enhance rapid hemostasis and absorb enzymatically in a matter of a few days. 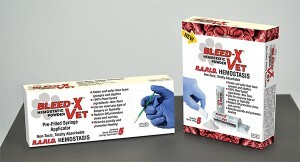 Is Bleed-X Vet safe to leave inside the body? Yes, in fact, Bleed-X Vet is clinically proven to absorb soon after the initial clot has formed – the MPH/OC matrix quickly degrades by endogenous amylase and pyrase, leaving no residual to act as a nidus for infection or adhesion formation, virtually eliminating any chance of granulomas. The combination of safety and efficacy are unmatched by any hemostatic product used today in veterinary medicine. Where can I use Bleed-X Vet? Bleed-X Vet is safe to use in any case where bleeding is presented from general trauma to virtually all surgical applications – biopsies (liver, spleen, pancreas, etc. ), lobectomies, spays, neuters, suture lines, dew claws and tail docks, de-claws, dentals/periodontals, mass removals, amputations, orthopedic surgeries, eye enucleations, even neuro-surgery like hemilaminectomies – anywhere hemorrhage control is an issue.